I have to admit that I always love when my kids get a snowday off school or, as is now the case, Uni. It happens so rarely here beside the sea that we always have fun out making snowmen or going for walks in the snow and then there is all that lovely hot chocolate to enjoy when we get back home again. So this novella from B R Maycock definitely appealed to me, while I wonder whether we will get snow again this year. At around 180 pages, you have plenty of time to squeeze this festive read in before the big day. The story begins when rather frazzled mum, Eloise, wakens to a snowy day and discovers that while one of her three children has a ‘snowday’ from school, the other two don’t and neither does she! What follows is a rather madcap journey through the next few weeks towards Christmas as Eloise finds she has rather lot of romantic possibilities all of a sudden, one of which is her ex-husband Gary! She has been single for a while and used to coping, even if only just coping sometimes, with the demands of work and childcare with little input from Gary who is in a new relationship. All of a sudden, he seems to want to have a lot more to do with the children and Eloise isn’t sure she is happy with that. However, not one, not two but three other men all seem to be interested in Eloise at the same time so she really is spoiled for choice and completely confused! 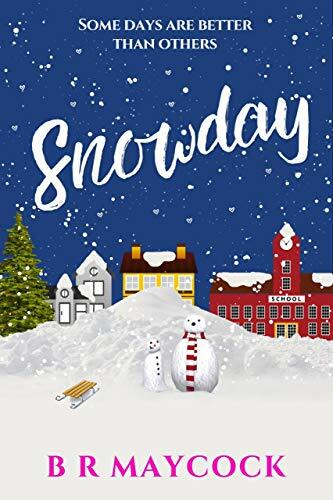 Snowday is a fun-filled fast-paced rom-com with plenty of laugh-out loud moments and parts where you will be cringing on behalf of Eloise and wondering what on earth she is thinking about! But there are more serious parts too, looking at the reality of life as a working parent, the compromises needed at Christmas time when a marriage has split up but above all, the importance of being with those you love. Eloise is a character that I really warmed to and I hope we find out more about what happens to her and her lovely family in future books from BR Maycock. Now read on for an extract from the book where the main character Eloise gets a phone call which does not fill her with festive joy! ‘I hope you don’t mind but we’ve decided we’d like a family Christmas this year,’ her mother said somewhat tentatively. Eloise’s heart stopped. Her mother never wanted a family Christmas. Like clockwork, her family disappeared off to Florida each year, mentioning it in passing but very obviously hoping she wouldn’t come. ‘I’m in work, Mum. And everyone is listening in on my conversation.’ There was giggling around the office, including David, who was sitting on Martin’s desk, chatting to him. Their camaraderie would have been nice to see any other time but Eloise was too worried. People in the office promptly moved, looking embarrassed. There were a few mouthed ‘sorry’s. Her mother went quiet for a minute. All Eloise wanted was to hear her dad speaking in the background. She had the most terrible feeling that it was him and not her strong hardy mum. ‘My cousin Sally,’ Eloise interrupted, unable to stop herself grinning. Her mother always pretended that their family were somehow not actually related to them. ‘Your aunt is such a copy cat!’ her mother cried. ‘The second she heard we were going again this year she said we’d reminded them that they needed a holiday too, you know, because she’s so busy with work.’ A huge source of contention in their house. Eloise’s mother was the only stay-at-home mum and had regularly been laughed out of the place for declaring that people who raised children at home should be paid as they were raising the workforce of the future. It didn’t go down well in a house made up of mostly females who did the working mum thing with gusto. Eloise felt the room spin. Why hadn’t her mother assumed that Eloise would automatically have the kids? And then she remembered, Gary and Disneyland Paris. She felt her gut twist even more. Her mother made some grumbling noises and there was a moment of muffled speaking before Eloise’s dad spoke. ‘So, Lou, what you up to?’ Her dad always thought that was hilarious. The difference was, she laughed at her dad’s jokes and not her mum’s. She felt guilty about it, but it was engrained, and wasn’t likely to change anytime soon. ‘Nothing much, just selling boxes,’ she said, as always. ‘Company hasn’t folded yet, then?’ her dad asked, his glee audible. ‘Still in good shape,’ Eloise said, smiling too. It only ever took a few minutes of speaking to him to calm her down. Thanks to the author for my copy of the book. Snowday is available now as an e-book and you can order a copy from Amazon UK here or from Amazon.com here.